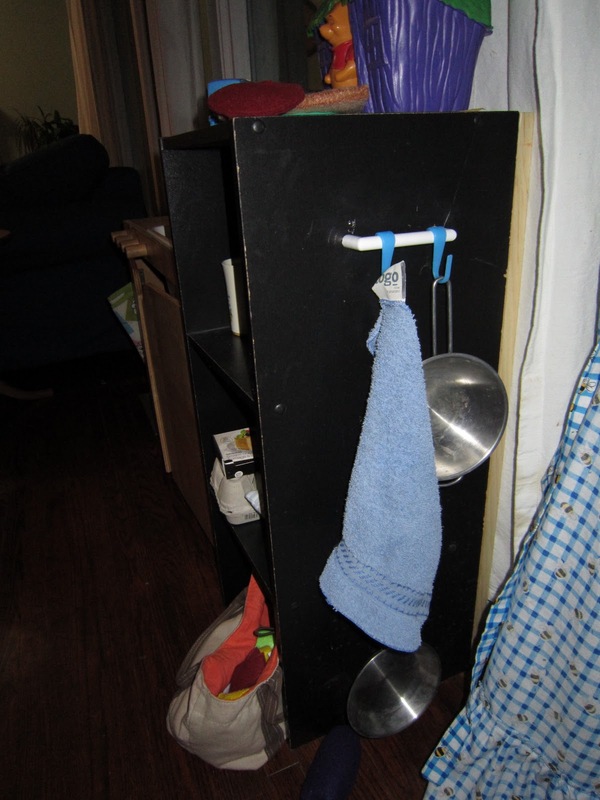 A few weeks ago I found a wooden play kitchen for free on Kijiji. I know. How could I pass up such an amazing offer, especially since I just made a lot of felt food at Christmas?! My wonderful husband went and picked it up for us. It has been a big hit even though we didn't fix it up or anything. This past week we finally got to doing some work on the play kitchen. I liked how it was simple as it leaves more room for the imagination. 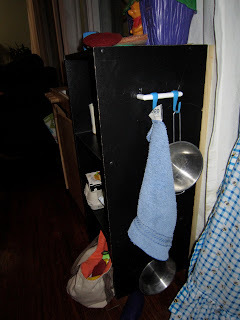 We did add some hooks and a bucket for storage. Jon also added a back to the black shelf so the food wouldn't fall out. Our intent is to add doors to make it a fridge. When we get some time and money we'll get to it. In the evenings I have been making a few more pieces of felt food. Pictures below is a slice of tomato, a piece of lettuce, slice of swiss cheese, a loaf, half a bagel, a piece of watermelon and some peanut butter. TJ calls it Wow Butter (a new soy butter we are trying due to MJ's peanut allergy). I have grand plans but little time. I am working on some strawberries, an apple, a cob of corn and another half of a bagel. I'l love to purchase a set of wooden meats you can slice. And I've got plans to knit a dozen eggs for our empty carton. Any suggestions for more things to make?